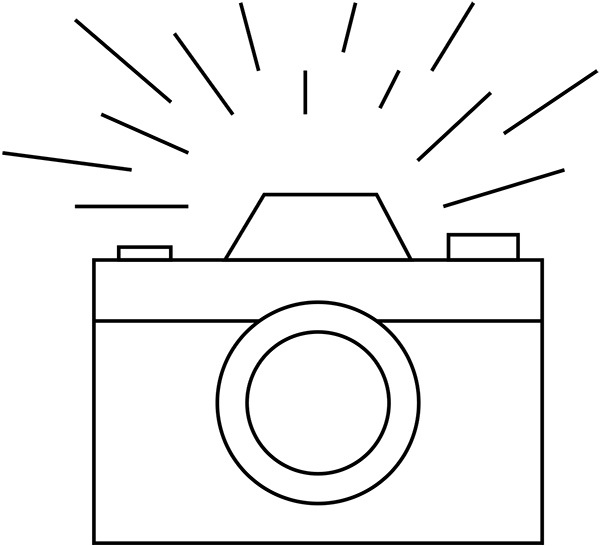 We are able to see mixtures of two-color rays as one color. We don’t need green light in order to see green, and we don’t need orange light to make us see orange. 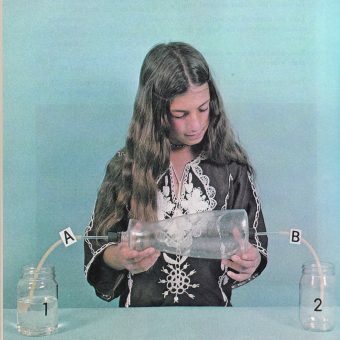 Mixtures of blue and yellow light and yellow and red light will create green and orange for us. To make the eyes see all color, then, only the three primaries — red, yellow, and blue — need be used. 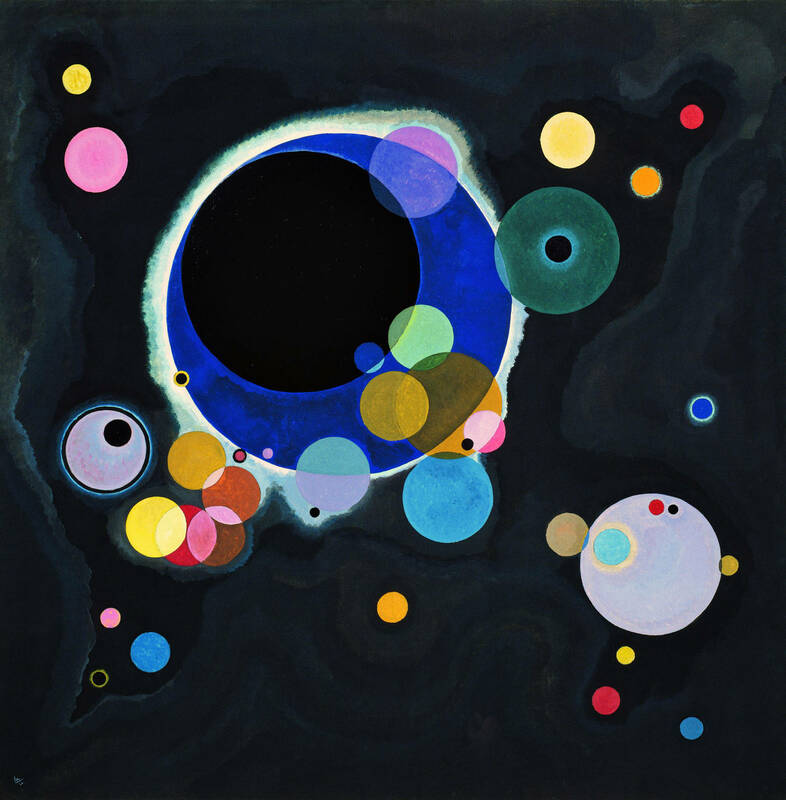 From these primaries, a complete color circle can be created. That is why it is possible to reproduce the brilliant colors of nature, faithfully, with just three primary colors in modern color reproducing processes. And color itself is a degree of darkness, an idea that refutes Isaac Newton (25 December 1642 – 20 March 1726) and Light and Refraction (1704), the hymned scientist’s study of the interactions between sunlight and prisms. 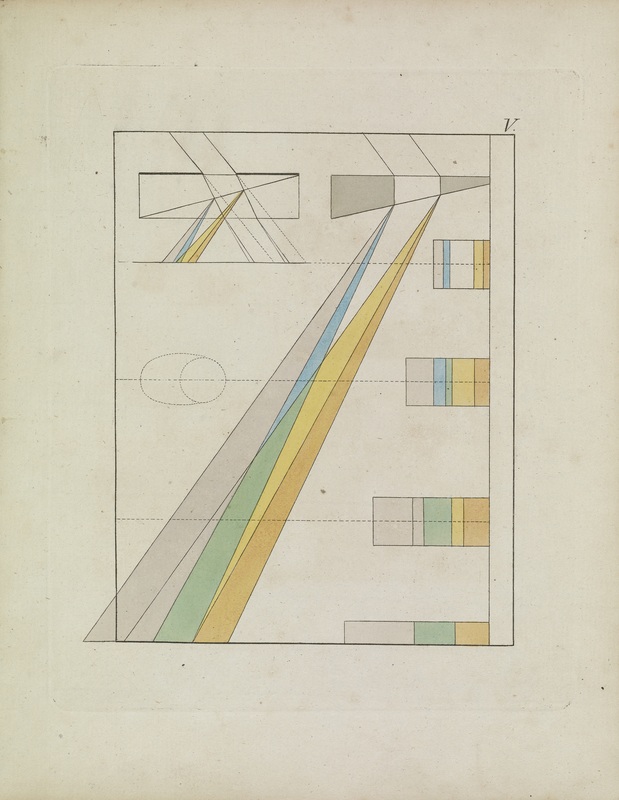 Newton considered colors in isolation as existing exclusively in light. He taught us that clear white light was composed of seven visible colors – a number rooted in his rather mystical views on the importance of the number seven – establishing the visible spectrum (the colors we see in a rainbow: ROYGBIV colors on a scale from the longest wavelength to the shortest (red, orange, yellow, green, blue, indigo, and violet)). (Factoid: the world’s oldest color is pink.) 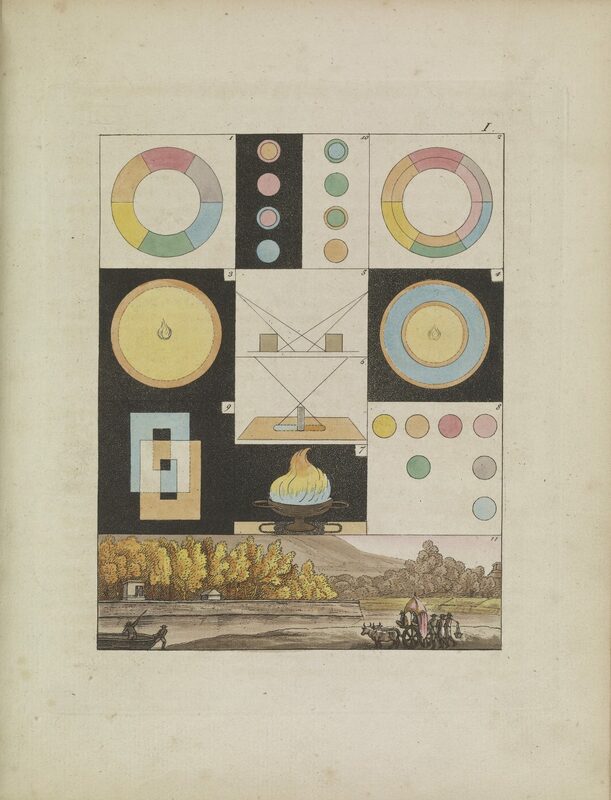 Goethe threw in elements Newton overlooked: human perception and subjectivity. 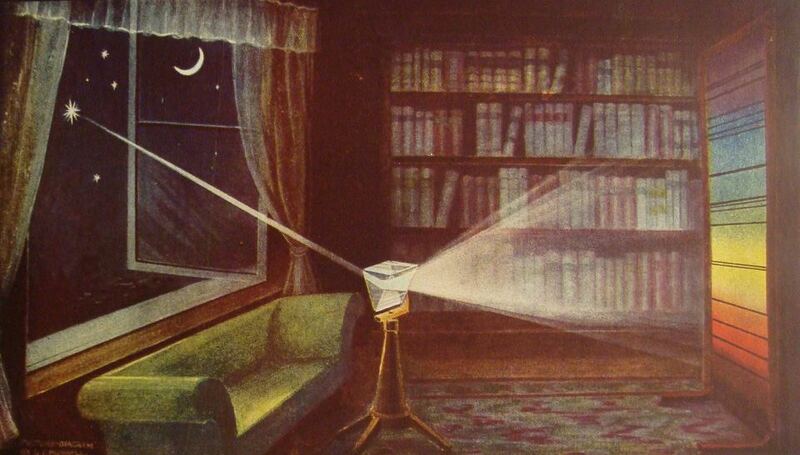 “Along with the rest of the world I was convinced that all the colors are contained in the light; no one had ever told me anything different, and I had never found the least cause to doubt it, because I had no further interest in the subject. 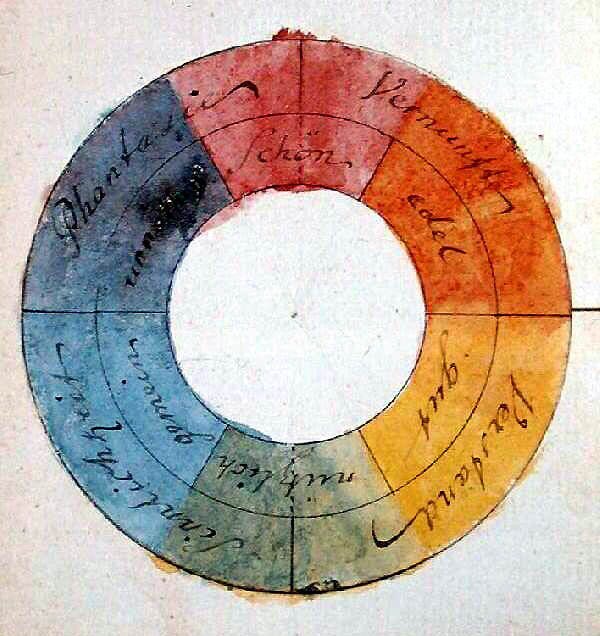 The “rose of temperaments” (Temperamentenrose), a study from 1798/9 by Goethe and Schiller, matching twelve colours to human occupations and character traits (tyrants, heroes, adventurers, hedonists, lovers, poets, public speakers, historians, teachers, philosophers, pedants, rulers), grouped in the four temperaments. 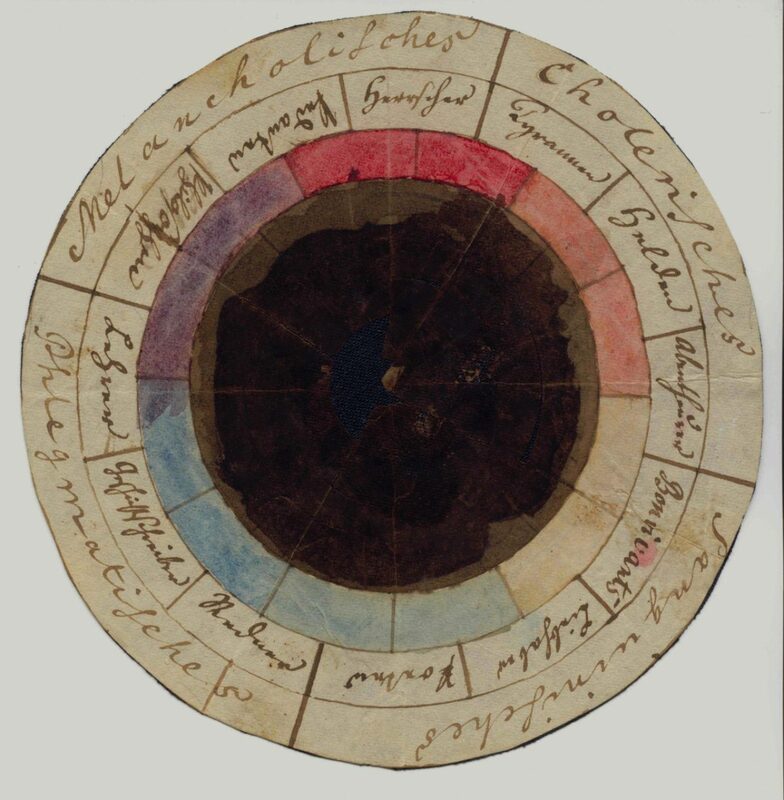 Goethe located more colors in the edges between light and darkness, his “light – darkness polarity”. 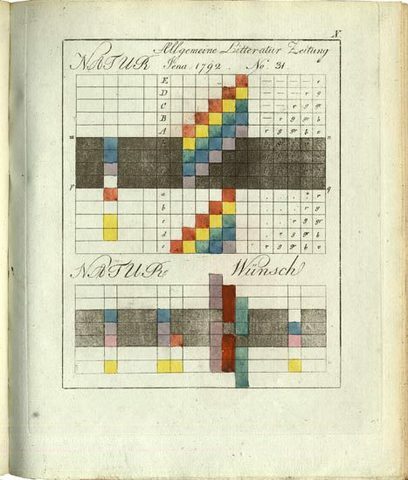 Newton was measuring how light worked physically – he sought the tangible; his original color wheel included “musical notes correlated with color” – while Goethe was beginning to record how humans perceive colour. 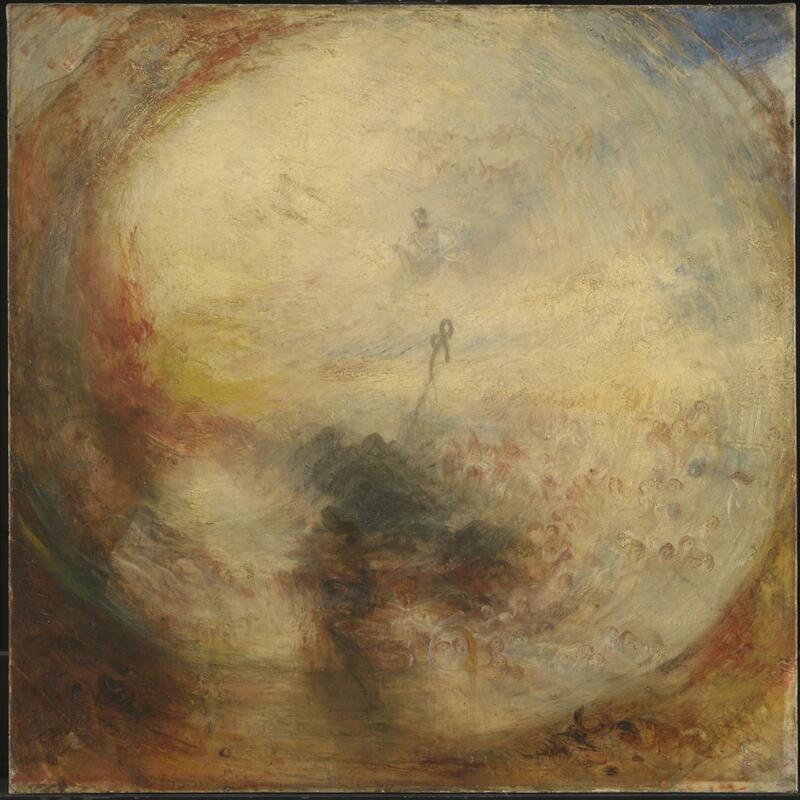 Color could be deployed as an emotional force. 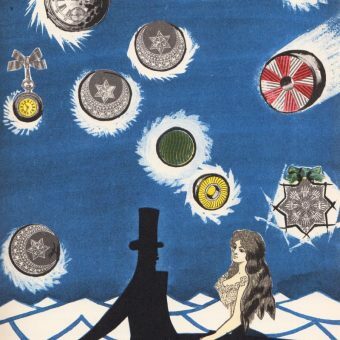 Goethe illustrated his thoughts. 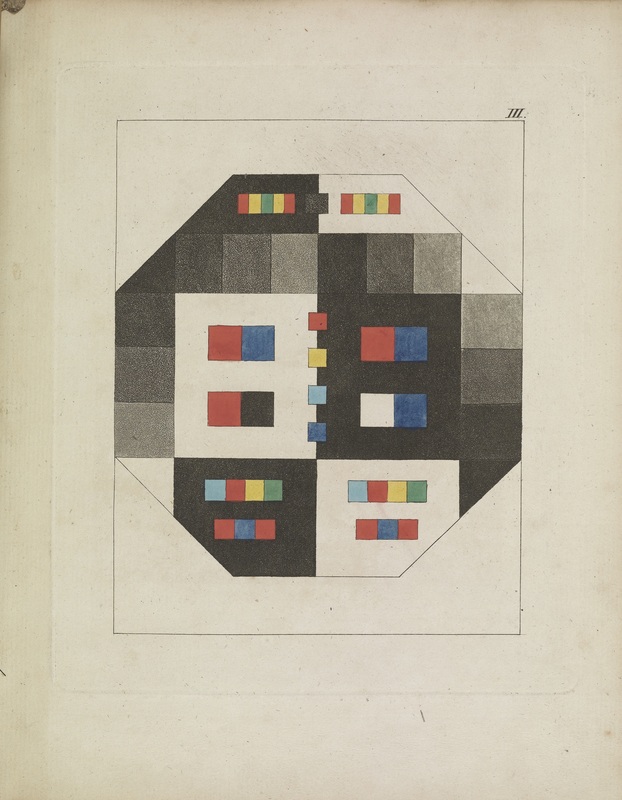 Some of his colorful and abstract diagrams and wheels are shown here. 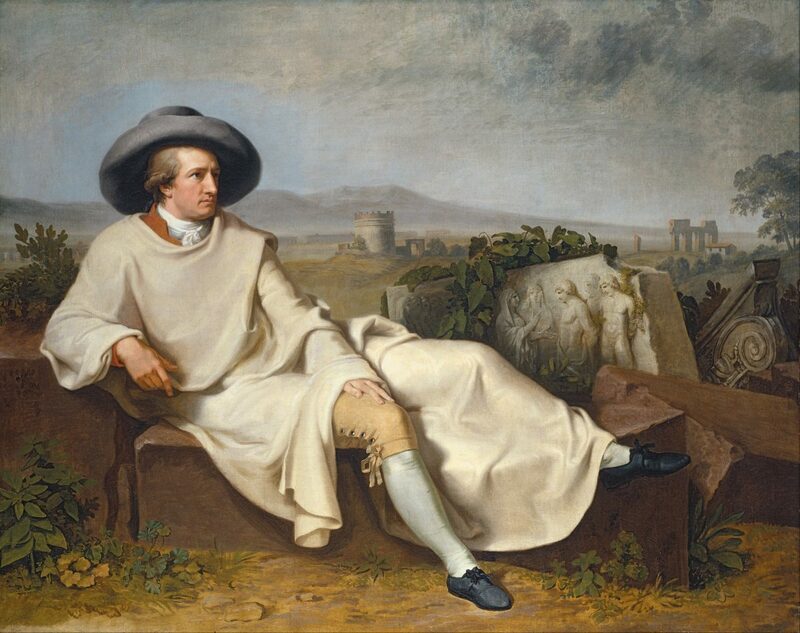 Goethe’s thinking influenced painters then and now. 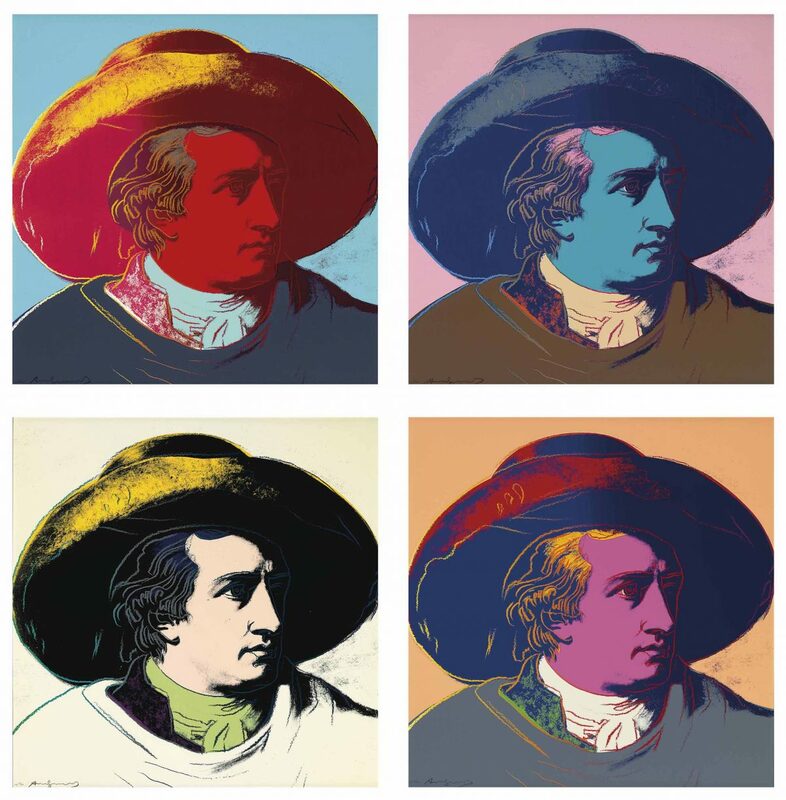 In the 1980s, Andy Warhol updated Johann Tischbein’s most famous painting, Goethe in the Roman Campagna (see lead image above), turning the subject into a pop icon; Joseph Turner’s painting Light and Colour (Goethe’s Theory) – the Morning after the Deluge – Moses Writing the Book of Genesis (1843) pays tribute to Goethe; and Wassily Kandinsky produced his own “schematic outline” of the psychological effects of the world’s oldest colors titled Concerning the Spiritual in Art (1911). Whoever is acquainted with the prismatic origin of red will not think it paradoxical if we assert that this color partly actu, partly potentia, includes all the other colors. 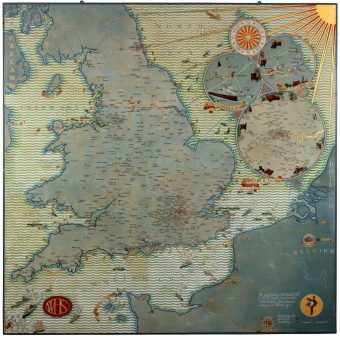 Via: Open Culture, The Tate, Bain Pickings.